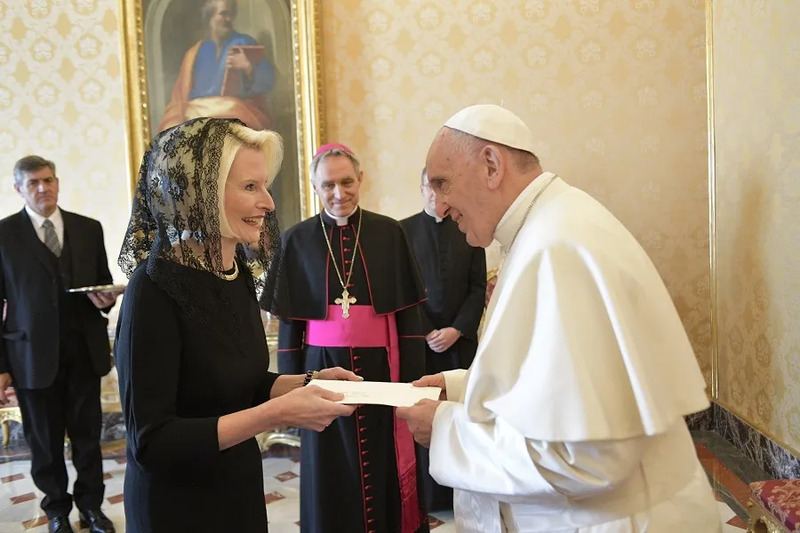 Vatican City, Dec 22, 2017 / 05:00 am (CNA/EWTN News).- Newly-appointed American Ambassador to the Holy See, Callista Gingrich, presented her letters of credential to Pope Francis in a meeting Friday morning, officially marking the beginning of her duties. U.S. President Donald Trump nominated Gingrich to serve as the 11th ambassador to the Vatican in May, and she was approved Oct. 16 by the U.S. Senate, in a vote 70-23. She follows Kenneth F. Hackett, the former head of Catholic Relief Services, who served as U.S. Ambassador to the Holy See during Barack Obama’s second term as president. Gingrich arrived in Rome with husband Newt Gingrich Nov. 6. Since arriving, she has participated in several events around Rome, including the North American College Thanksgiving dinner and a charity event hosted by St. Patrick’s American Community. Newt and Callista married in 2000, after having a six-year affair while Newt was married to his previous wife. Newt converted to Catholicism in 2009 and explained, in an interview that year with Deal Hudson at InsideCatholic.com, how Callista’s witness as a Catholic brought him towards the faith. Vatican City, Nov 23, 2018 / 09:42 am (CNA/EWTN News).- The approach of Pope Francis’ meeting of bishops in February, on the topic of abuse prevention in the Church, will reflect the synodal journey, Fr. Hans Zollner told Vatican Media Friday. Santiago, Chile, Jan 16, 2018 / 06:33 am (CNA/EWTN News).- On his first full day in Chile, Pope Francis told Catholics in the country that the Beatitudes aren’t just a simple piece of advice from someone who purports to know everything, but they are a source of hope which impels people to leave their comfort zone and follow the path given by Jesus. “The Beatitudes are not the fruit of a hypercritical attitude or the ‘cheap words’ of those who think they know it all yet are unwilling to commit themselves to anything or anyone,” the Pope said Jan. 16. The Beatitudes, then, “are born of a merciful heart that never loses hope. A heart that experiences hope as a new day, a casting out of inertia, a shaking off of weariness and negativity,” he said. 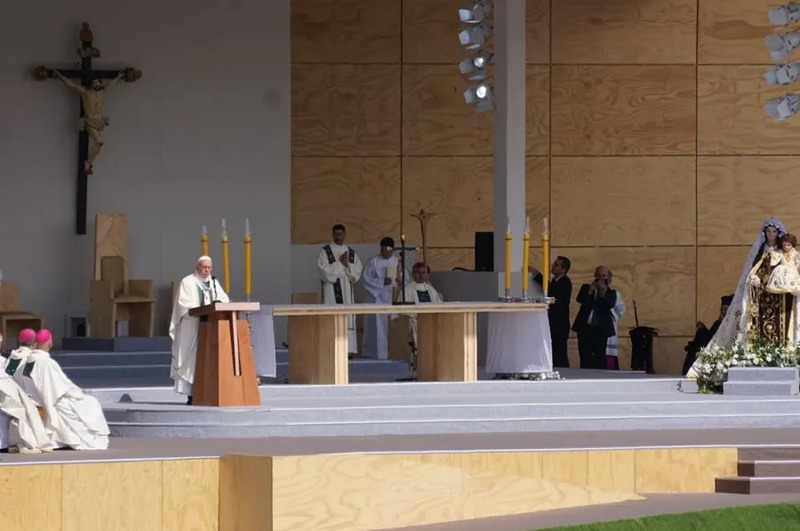 Pope Francis spoke during his homily for Mass at O’Higgins Park in Santiago on his first full day in Chile. He is currently in the first step of a two-country visit to South America, which will also include a stop in Peru. He will visit various cities in Chile, including Temuco and Iquique, and on Jan. 18 will travel to Peru, where he will visit Lima, Puerto Maldonado and Trujillo. In his homily for Mass, Pope Francis focused on the day’s Gospel reading from Matthew in which Jesus speaks on the Beatitudes. Rather, the Beatitudes “are born of the compassionate heart of Jesus, which encounters the hearts of men and women seeking and yearning for a life of happiness,” he said, noting that these are men and women who know what it means to suffer and who appreciate “the confusion and pain of having the earth shake beneath their feet” or seeing their life’s work washed away. Francis said the Beatitudes represent a “new day” for all those who look to the future and dream, and who allow themselves to be moved and sent forth by the Holy Spirit. Only in this catastrophic pontificate would such an ambassador be so perfectly fitting. This adds a still further layer of shame. Saint JP II – Pray for us.